Princess Diana spent the last days of her life in 1997 with Dodi Fayed, the son of an Egyptian billionaire. Near the end of that summer, on Aug. 31, the pair were fatally injured in a car crash at the Pont de l'Alma tunnel in Paris. Diana was just 36 when she died and left behind two sons, Prince William, now 35, and Prince Harry, now 32. Fayed was 47. The couple had just finished a vacation in the south of France where they stayed on a yacht belonging to Fayed’s father, Mohamed Al-Fayed, the longtime owner of Harrods department store in London. Diana, Princess Of Wales is seen in St. Tropez in the summer of 1997, shortly before Diana and boyfriend Dodi were killed in a car crash in Paris on August 31, 1997. Diana, Princess of Wales, and Dodi Fayed, walk on a pontoon in the French Riviera resort of St Tropez, Aug. 22, 1997. Diana and Fayed were photographed together during the trip, fueling the paparazzi’s interest in the seemingly early stages of a relationship. At the end of the vacation, Diana and Fayed decided to travel to Paris for a night before Diana returned home to London. 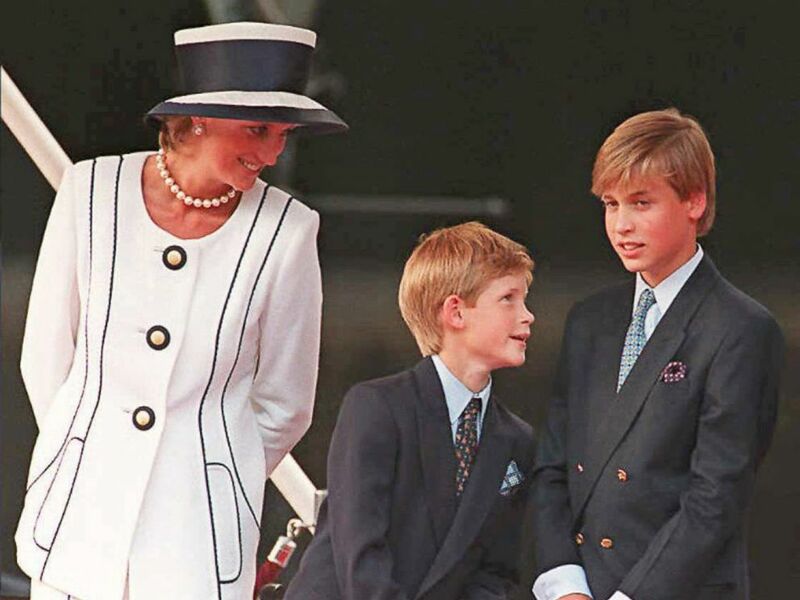 Sometime on Aug. 30, Diana called William and Harry, then 15 and 12, respectively, who were at Balmoral Castle with their father, Prince Charles, in what turned out to be her last conversation with her sons. 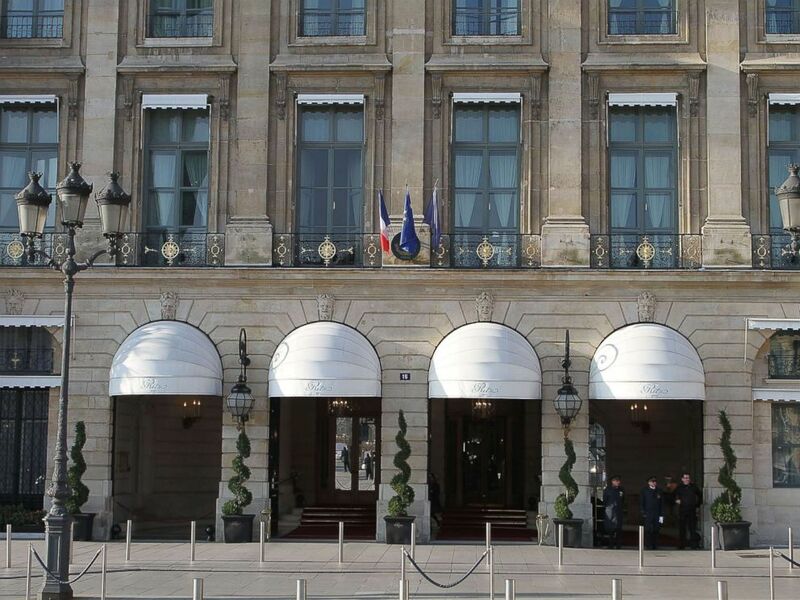 Exterior view of the Hotel Ritz Paris, Nov. 15, 2011, in Paris. Harry said in a documentary that aired in July he will have regrets "for the rest of my life, how short the phone call was. And if I'd known that was the last time I'd speak to my mother, the things I would have said to her. ... Looking back on it now, it is incredibly hard." Diana and Fayed arrived in Paris on Aug. 30 with security in tow. They traveled to the Ritz Hotel, which was also owned by Fayed’s father. Princess Diana, Prince Harry and Prince William gather for the commemorations of VJ Day, Aug. 19, 1995, in London. Later in the evening, Fayed and Diana decided to travel to an apartment in Paris owned by Fayed. "At 7 p.m. that evening, Dodi al Fayed and the princess of Wales left the Ritz Hotel to go to Dodi al Fayed's apartment," British investigator Lord John Stevens, who led the inquiry into Diana's death, said in 2006. "They had no intentions of returning to the Ritz Hotel that night." Diana and Fayed had planned to dine that evening at a well-known Paris restaurant and were on their way there, when, "because of the attention of the paparazzi during the journey, Dodi al Fayed instructed his chauffeur to drive instead to the Ritz Hotel," according to Stevens. The couple had dinner at the Ritz and then, later that night, made the fateful decision to be driven back to Fayed’s apartment. Fayed and Diana were seen on hotel surveillance footage smiling on an elevator on their way to leave the hotel through a back entrance. 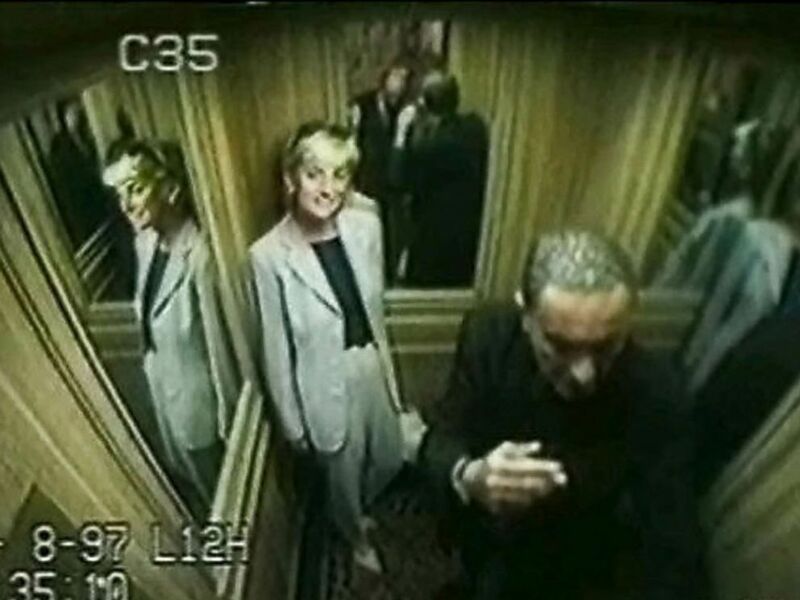 Princess Diana with Dodi Fayed in an elevator at the Ritz hotel in Paris on Aug. 30, 1997, shortly before they died in a car crash. The couple rode off in a black Mercedes driven by Ritz security employee, Henri Paul. Their bodyguard, Trevor Rees-Jones, was in the front passenger seat. The Mercedes, chased by paparazzi, was speeding when it hit a concrete pillar at 12:25 a.m. local time in the Pont de l'Alma tunnel near the Seine River. 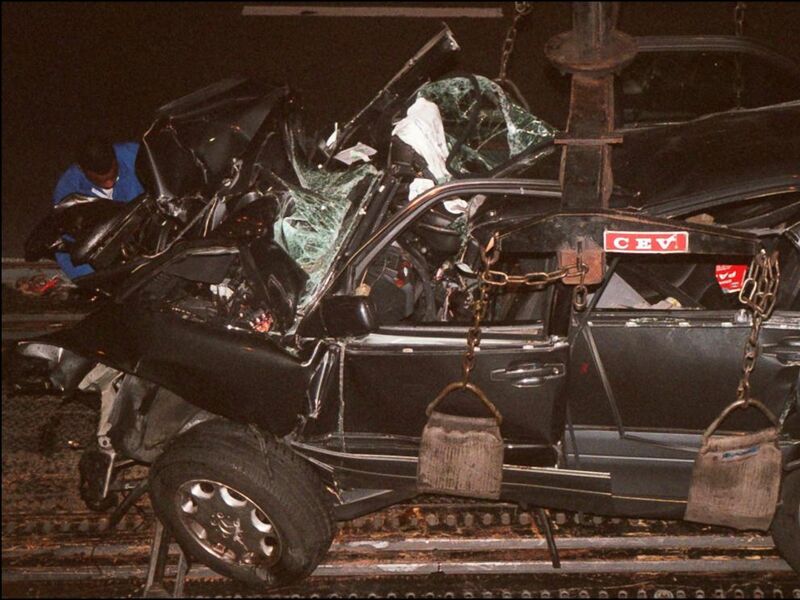 Emergency crews work on the wreckage of Princess Diana's car in the Alma tunnel of Paris. Fayed and the driver, Henri Paul, who was seen drinking in the Ritz bar earlier in the night and whose blood alcohol level later showed he was drunk, died in the crash. Instead of transporting Diana by ambulance to the nearest hospital, medical personnel spent nearly one hour treating her at the scene. While the public and her sons will never know whether that decision could have changed the outcome of history, critics have argued that Diana may have lived if French authorities had immediately rushed her to the hospital. Lady Sarah McCorquodale, Diana's sister, told the BBC in a documentary that aired this month that she is still haunted by the tragedy. "She was religious in putting on her seat belt," she said of Diana. "Why didn't she put it on that night, I'll never know." William and Harry described in the same BBC documentary, "Diana, 7 Days,” how they still feel anger over Diana's death. "I think one of the hardest things to come to terms with is the fact that the people that chased her into the tunnel were the same people that were taking photographs of her while she was still dying in the backseat of the car," Harry said. "William and I know that. We’ve been told that numerous times by people that know that that was the case." He continued, "She’d had a quite severe head injury. She was very much still alive in the backseat, and those people that caused the accident, instead of helping, were taking photographs of her dying in the backseat." When Diana was transported to the hospital, the ambulance stopped for a doctor to perform further treatment as her condition deteriorated and her blood pressure dropped precipitously along the way, according to testimony from French doctors at the inquest into Diana's death. Diana was unconscious but alive with a heartbeat when she finally reached Pitie-Salpetriere Hospital in Paris. Doctors there performed cardiac massage as surgeons tried to repair a ruptured blood vessel near Diana's heart which was causing massive internal bleeding, it was revealed at the inquest. Diana's brother, Lord Charles Spencer, recently shared how the family dealt with the tragedy as it was unfolding. "My sister Jane called again and said it was looking quite serious, really quite serious," he recalled. "She was on one line to me but because of her husband's [Lord Robert Fellows] job as the Queen's private secretary I could hear him on another line." He continued, "I heard him go, 'Oh no,' and then Jane said, 'I'm afraid that's it.'" Diana was pronounced dead at 4 a.m. local time on Aug. 31. Rees-Jones was the lone survivor of the crash.